A new organization, ISLANDS ON THE AIR (IOTA) Ltd. is a non-profit company previously managed by the Radio Society of Great Britain. The new program will aid island chasers to seek less costly and user friendly awards and database security. This modernized website contains an updated official list of island reference numbers and names of islands that are valid for each IOTA group. Also included are a list of rules, Checkpoints for each call area or country, IOTA island groups that are presently active on the bands, alerts for islands that you need and program news. The program will allow you to make an initial award application or add to your existing database as you make new island group QSOs which are confirmed by QSL or confirmed by Club Log or by the annual IOTA contest . The program will also permit use of Google Earth to provide an overlay of all IOTA groups to help you identify the location and details of the islands of interest. An exciting component includes use of paperless electronic confirmation of contacts found on logs you downloaded to Club Log and then transferred to IOTA. It will help reduce postage costs and the difficulty in receipt of QSLs to simplify and expedite application requirements of this magnitude, it has required costly software programming integration into the existing program. Please note that there are NO FEES to utilize the new program and maintain your personal database including your list of islands that you have inserted into your records. However, if you wish to add island groups to your official record or apply for awards, you will be required to make an application and pay for the update to your Checkpoint or directly to HQ. IOTA Ltd. seeks support from all island chasers to fund the extensive programming and management and request that you become a FRIEND OF IOTA by donating to this significantly improved global award program. I am a FRIEND OF IOTA and I encourage you to become one also. Details are listed on the website. THE IOTA 2018 DIRECTORY (18th edition) provides extensive details regarding the entire IOTA program including rules, lists, stories and details of interest. It is a valuable resource if you plan to activate an island and to be certain it meets valid IOTA criteria. You can obtain a new Directory only from IOTA Ltd. You can request a copy at islandsontheair@outlook.com for 12.00 British Pounds (GBP) plus postage and handling using PayPal. The new internet based IOTA program is available to all hams and is compatible with present day abilities of computers. There is no cost to utilize the new program unless you request an award or update your official record. Be assured that your prior data as well as any new islands you have put into your own personal database will remain on the web site as long as you remain active so that only you can view your data. There has been great effort to keep your personal data secure and thus the reason for the initial registration process. Whether you are new to the IOTA program or have been a prior applicant, you will be asked to fill in your personal database and create your own password in order to utilize the website and to make an application for awards. You can then start loading in new island groups at no charge. You can use ADIF files, IOTA contest QSOs and/or Club Log logs that you have downloaded as well as insert new island groups confirmed by QSls into your database. Be sure to input the correct call as noted on the QSL card, the island listed on the QSL, the IOTA number and QSO details. If you make a typing error or insert the wrong island or call, the program may alert you to a problem. This website has details of the program including instructions, fee structure, and recommended procedures for North American applicants. Anytime you need help, just e-mail me the problem along with your call and I can check it out. This is the MM/W9DC/P operating location near the jetty of Fidra Island.The gulls, puffins, oystercatchers and the pileup made a lot of QRN. It counted for IOTA, EU-123, WLH-0313 and Islands of Scotland Award FF-04. HOW DOES THE PROGRAM WORK? Your data will be stored on the IOTA Ltd. website. It is a user friendly program that does not require floppies or the need to maintain a home based IOTA computer program or worries about how to load it. Once you complete your profile and create a password, you will be able to create your personal database and your own list of island groups. The program will allow you to add new QSOs into your database. If there is a major conflict with the data such as wrong call, wrong island name etc., it will alert you to recheck your input. Newly inserted island group QSOs will remain within your database awaiting submission and approval. You will need to submit QSLs to your Checkpoint for ADIF and hand inputted island groups (no cards required for IOTA Contest and Club Log contacts). Your designated Checkpoint will review the cards and preliminarily approve them. The list will then be reviewed by IOTA Centre who will review the list, reexamine any questionable cards and identify any QSLs that have been found to not meet valid criteria. IOTA Centre will then finalize your application so that accepted island cards will then be part of your official island count and show up on your database as approved. The program does require you to follow the directions carefully but the program will walk you through the process and you will experience minimal problems. In any event, I am available to help should you have a problem getting started or need further explanation on final application results. IOTA CONTEST and CLUB LOG QSOs: You will be able to get direct credit for QSOs made during the IOTA contests. There is a small charge for receiving credit for matching QSOs. Just insert your new QSO data into your own database and follow instructions to receive credit assuming the new islands you worked sent in a log that contains your call and matches the details of the QSO. It does take some months following the contest before all the data can be entered into the website to make a valid match so please be patient. Club Log matching is a new and cost savings program but please follow the directions for downloading an ADIF file to Club Log to generate the valid QSOs. There is a delay in getting new matches to show up and Club Log stations may refuse to allow use by IOTA Ltd.
CHECKPOINTS: Each Checkpoint has his own style of managing his duties depending on his location, mail situation, etc. I am responsible for those U.S. stations having a 4, 5, or 6 in their calls no matter where they are located as well as all Pacific and Caribbean Islands having U.S. zip codes. My address is Don Chamberlain, 2 Coxswain Place, Salem, SC 29676. Please note that if you are a U.S. station with a 1, 2 or 3 in the call, then your Checkpoint is Dan Sullivan, W4DKS, at 14737 Pickets Post Road, Centreville VA 20121. If you have a 7, 8, 9, or 0 in your call, then your Checkpoint is Bruce Osterberg, N9BX, at 6881 Biddex Evans Road, Ocean Springs, MS 39564. They are always willing to help you with problems and I have included their email addresses. 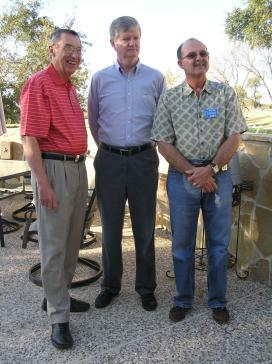 The photo at the left is Don, W9DC, Dan, W4DKS and Bruce, N9BX at the 2008 IOTA BASH. MAKING AN APPLICATION: The old application form is no longer used. Now you must complete your personal database (profile) found on the IOTA Ltd. website. Your name as listed in your database will be used for Certificates and your correct mail or email address as listed in the database will be used to send your awards so please double check the accuracy. A telephone number and your latest e-mail address is important in case your Checkpoint wishes to contact you regarding your application. database. Input your new island groups and QSO details into your personal database on the website. When you finish inputting your QSL card data and you are ready to submit, then press the submit button and follow the directions. It will ask you for desired awards and how you want them delivered so you can print them(I recommend email due to cost). It will also ask you to provide the cost of the application in US Dollars. Send your application to your assigned Checkpoint with the cards you wish approved as well as funds for the application and postage for the return of the cards. PROBLEM QSLS: There are a few common causes for an invalid QSL. IOTA requires that a specific island name (or clearly defined location such as an Antarctic base) be printed on the QSL (not handwritten) to confirm the island group. The island name should be listed in the Directory or on the RSGBIOTA.org website since there are islands close to the mainland that do not meet the IOTA criteria for a valid island. Also, some islands have the same name as the mainland district which can be confusing. Hong Kong, Macau and a few other common locations comprise both mainland and islands. Some islands also have adjacent island groups with the same call sign thus card examination is required to determine the proper island group. Such examples might be Fiji, Tonga, Madagascar, Australia, etc. Some cards have an incorrect IOTA group number so the island name becomes critical. Rarely, QSLs are determined invalid because of manipulation of information, illegal operations, etc. Please double check the details and validity of your submitted QSLs to avoid rejection. NEW FEE STRUCTURE: Fees are based on the British Pound £. Applicants within the United States and possessions will have the British Pound automatically converted to U.S.dollars. The exchange rate fluctuates on a daily basis and HQ will try to stay up to date on exchange rates plus the extra cost of such transactions. The exact conversion factor can be found on the IOTA Ltd website once you make an application. Funds can be sent to HQ using PayPal address “Islands on the Air (IOTA) LTD”. If you prefer, you can send me cash, a check made out to me, Don Chamberlain, or use PayPal (IOTA@W9DC.com). I do not maintain a credit balance list because of the additional paperwork but I will return any excess funds submitted. Please remember that you must send me enough funds to cover return of cards. If you only use Club Log in your application, just send the application fees to IOTA HQ via Pay Pal or to me as noted above. SUGGESTIONS ON MAILING APPLICATIONS: It is up to you to determine how you wish to send your cards and how you want them returned. Priority Mail normally only takes 3-4 days and the post office supplies free sturdy envelopes and boxes to preserve your cards against potential damage during shipment. This method includes tracking so you can follow your cards. It is the most popular method of sending cards and works well with my local post office. If you are only submitting an application using Club Log or Contest island groups, then you only need to send cash or check or just use PayPal. New Postal Rule: The Post Office now requires envelopes and boxes that weigh more than 13 ounces to be postmarked with the Post Office postage sticker for security reasons. If you choose to mail a heavy flat rate box with a stamp affixed, the package may be returned. It seems that the postal rates keep increasing. As of 1/27/2019, the priority flat rate envelope is $7.35, the small flat rate priority box is $7.90 and the medium flat rate priority box is $14.35. Do not be surprised if these postal rates are increased in the near future so be sure to check with the Post Office. To protect your QSLs from getting wet or straying from a partially opened package, you might wish to insert the cards into a zip-lock bag. A few rubber bands help secure them in place. You can put your address card inside the bag should something happen to the outer container. I will be happy to send an E-Mail when the package is received if so requested. Turn around time is just a few days if I am in town. Place your cards in the order as noted on the island application form. The Checkpoint will check the cards to confirm validity and proper information, then send this data to IOTA Centre to confirm the request and then automatically update the applicant’s database. He will also alert IOTA Centre about requested certificates etc. who will then process them and forward to the applicant. With the new program, I suggest you receive certificates by e-mail which require you to print out the certificate. I have received my new personalized certificates by e-mail and my small color printer did an excellent job. HINT: When making an application and searching for old QSOs, besides searching your logs, LOTW and Club Log, you might wish to review call signs of prior major operations for each IOTA group. This information is found by using the search box on the website. You may find a few new ones that you worked and may even have received a QSL. Make sure you tell your Checkpoint about your old calls if they are on cards you are submitting and he will insert it into your database. Keep your database up to date including address, telephone number and email. Should you change your callsign, you need to notify your Checkpoint so he can make that change in your database. 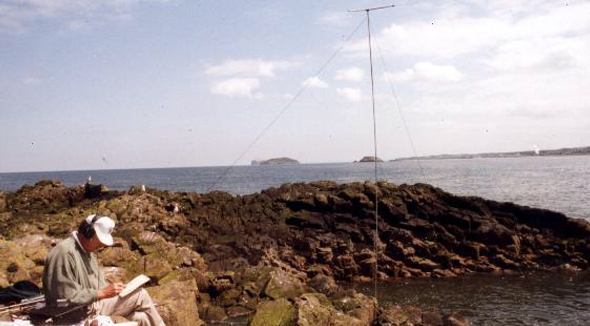 The Island Radio Expedition Foundation (IREF) is a tax-exempt organization that encourages activation of rare IOTA islands by supporting them with funds donated by interested hams. I am one of the Directors that analyze applications by proposed expeditions and aid their operations. Unfortunately, the cost of travel and equipment to rare islands has increased significantly and any small amount can help them make a successful expedition. Visit the IREF website to better understand how it operates and to donate to this important program.